Who else hates caps? They get lost; they fall off randomly, and generally get ink on your hands when you try to top your pens with them. However, when looking for fountain pens, it appears like the best of the best pens have caps. Sometimes, you want the best of quality and convenience. Should it be so hard to find the two encapsulated in one pen? Well, I’ve tried and I have come up with a few pens that I think contain both qualities. I basically chose two fountain pens at both ends of the price spectrum: The Pilot Capless Decimo Fountain Pen and Namiki Raden Capless Fountain Pen. The Pilot Capless Decimo Fountain Pen is beautiful object. You would easily guess from looking at it that it would cost double its 150 euros. However, it doesn’t and you are getting an excellent product for a cheap price. I found that writing with this pen was easy and simple. The pen fit very well in my hand and I could right for an extremely long time with it. Also, the pen could write for quite a long time without needing to be refilled. This is an excellent pen. I think that people often see the price and think that the pen cannot be as great as it is because it is so cheap. Well, those people are wrong because this is a pen that is both wonderful to use and look at. 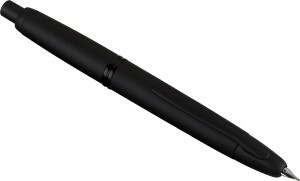 If you want something cheap and powerful, I would go with the Pilot Capless Decimo Fountain Pen. Now, the Namiki Raden Capless Fountain Pen is shiny. Why? Because the shell fragments that are wonderfully finished by hand into the pen. Yes, this is a luxury product. However, that being said, this pen does not feel too delicate. You can really push this pen for quite a long time. I know that I did. I did not need to press too hard to make deep marks, but when I was writing quite quickly the pen moved with me. It may feel like a collector’s item, but this pen is quite sturdy. Perhaps, this sturdiness comes from the fact that the pen has a rhodium plated nib. This nib is tough. I’m telling you that I thought I had ground the pen down but looked at the nib and it flashed light in my eye it was so shiny. This is a pen that you can use for a long time and forget that it is in your hands. Yes, it may be expensive but if you want an amazing retractable pen I would go with this. Retractable pens are excellent. They don’t require caps that get lost and end up everywhere but where you need them. If you are looking for a cheap retractable fountain pen that does twice the work for the price then I would recommend that you buy the Pilot Capless Decimo Fountain Pen. If you want a beautiful luxury product that is tough then I would go with the Nakimi. Finding a cheap fountain pen can be difficult. They are often very expensive and it can be hard to understand what makes one pen so different from another. Also, once you buy one of the more expensive pens, you don’t want to be a situation where the pen breaks due to shoddy construction. Unfortunately, pens can be cheaply made yet still be sold for astronomical high prices. So, with that in mind, I have tested out a few pens. The good news is that it is possible to find pens that won’t break and will write well. The Lamy 2000 retails for under 200 dollars. Don’t let this price fool you, this pen feels and writes as if it was worth double that amount. The pen has a beautiful black and silver design. It really is a wonder to look at. Also, the pen comes with a solid 14 karat gold nib. This nib is sturdy and smooth. The pen is also quite comfortable in hand. When I was using it I found myself writing for very long periods of time without taking breaks. In addition, when I was writing the pen stayed on the page without skipping once. This is one the nicest pens I had the opportunity to use. For the current price and more detailed reviews you can head over to the product page here. The Pilot Vanishing Point fountain pen’s name is descriptive. You can retract the point of the pen by clicking a button on the top. The nib is gold and quite durable. The clip is positioned near the top of the pen, closer to the nib, so that may take a while to get accustomed to. Overall, writing with this pen is a pretty smooth experience. It takes very little time to get comfy using this pen. I think that this is definitely a pen to use if you don’t like to fiddle with caps. The pen retails for 175 dollars. The Pelikan Tradition 200 Fountain pen has a steel nib that is gold plated. It also has a very cool window on it so you can view the ink inside the pen. The heft of the pen is nice. You can write with it for a very long time because the pen is so light. It also has a bountiful ink capacity. I used it for a long time before I had to refill it. The nib is sleek and makes writing a breeze. This pen retails for somewhere between 150 and 200 dollars. Each pen that I have discussed here is a fantastic writing instrument. If you are looking for a nice retractable pen that writes quite smoothly then I would recommend the Pilot Vanishing Point. The pen is durable and comfortable. If you are looking for a pen that looks astonishing, pleasing to hold, and easy to write with then I would recommend you go with the Lamy 200 Fountain Pen. If you want a light pen, with a very interesting design and excellent ink capacity, then I would recommend you go with the Pelikan Tradition 200 Fountain Pen. This Pilot Vanishing Point Retractable Fountain pen doesn’t really look like a fountain pen but more like a ball point pen due to its retractable nib function. It’s made in Japan and is available in many colours including matte black which looks cool. The other colours have a shiny lacquer finish unlike the matte look. We have a full Pilot retractable fountain pen review for you here on the site. The Vanishing Point pen doesn’t have a traditional cap but there are rings designed to make it look like it does. At the blind cap there is the button that can be pushed to bring out the nib. The top cap has a small opening on its head from where the nib comes out. The design of the pen is sleek and has an executive feel, very minimalist and classy with an understated feel. Indeed it is more the feel of this pen, which writes excellently, which makes this one of the very best fountain pens. The clip on the ‘cap’ is springy and helps to keep the pen in place. The nib or the feed doesn’t draw out when the pen is not in use due to its sophisticated ramp-like mechanism that shields the nib. So when a person pushes the button, the ramp slides down and the nib emerges. Talking more about nibs, you can unscrew the bottom of the pen and you can remove the ink convertor attached to the nib. The entire pen disassembles and you must be careful. The nib is made of 18 carat solid gold. Ink refilling can be done by dipping the entire nib unit into a bottle and turning the convertor piston. Alternatively, the convertor can be separated from the nib handle. It’s advised not to dip the nib into the ink while it’s still attached to the ‘cap’ as it’s not easy to clean the stray ink. When you come to the writing part, you’ll notice that the medium nib actually gives you fine nib like experience. For many people, the nib is not a great one. It scratches, it is dry and it also skips. To fix this, it’s highly suggested to take the pen to a nib miester to fix it. Once the nib is fixed, it writes smooth and doesn’t have any issues. It also writes a bit darker regardless of the ink type on a normal paper. Another hindrance while writing is the placement of the clip. 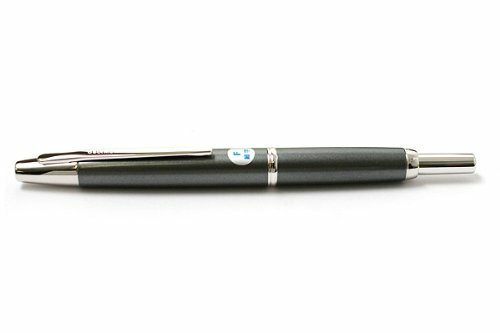 It is on top of the pen and makes it difficult to hold the pen while writing. Not a great thing for fast writers as it causes a lot of discomfort. This Pilot Vanishing Point Fountain pen is only a fountain pen in disguise. It is okay to use it on a regular basis but it’s not recommended to spend much on it as it has quite a few flaws. The good part about this pen though, is that it’s very practical to use. The ink also doesn’t bleed onto the paper or even leak in general. It’s not much on the design aspect not is it great on the writing aspect. Once the nib is fixed, then it’s a good writer but otherwise, it’s an average fountain pen in disguising itself as a ball point pen.